are high-performance fuses to keep your audio systems safe & protected for long term usage. Made with top-quality materials like Nickel & Gold-Plates to keep your audio system performing to its optimum performance! Tsunami Fuses ranges from 30 to 250 amperes of AGU, ANL & MANL (Mini ANL) styles that comes in a pack of five. 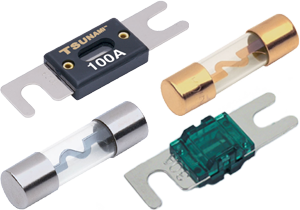 Keep your audio systems protected with Tsunami Fuses, all at a very low price!